tuning fork a device that produces harmonic vibration when its two prongs are struck; used to test hearing and bone conduction. See tuning fork tests. 1. A pronged instrument used for holding or lifting. 2. An instrument resembling a fork in that it has tines or prongs. replication fork a site on a DNA molecule at which unwinding of the helices and synthesis of daughter molecules are both occurring. 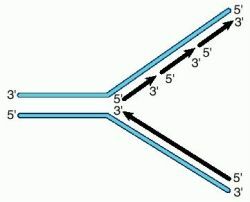 Replication fork, showing simultaneous synthesis of both strands; since synthesis occurs in the 5′ to 3′ direction, one strand, the leading strand, can be synthesized continuously while the other, the lagging strand, must be synthesized discontinuously in short fragments (Okazaki fragments) which are later joined. tuning fork a device that produces harmonic vibration when its two prongs are struck; used to test hearing and bone conduction. 1 an instrument with prongs. 2 something resembling such an instrument. A pronged instrument used for holding or lifting. The length of the wooden fork handle was determined by what the fork was to be used for, as well as the size of the person using the fork. The fork was given to Captain Fenner Palmer, of the New York Militia, which fought against the British during the American War of Independence. 8220;The popularity of the Fork Rhino encouraged us to tweak the current model to allow for some changes based on the feedback of our customers,” explains Kevin. South Fork is under threat from the West Fork Fire Complex, which consists of three separate wildfires: the West Fork Fire, the Windy Pass Fire and the Papoose Fire. Two sets of forks were used to tinker with bite size: a larger fork that held 20 percent more food than the fork usually used in the restaurant, and a smaller fork that held 20 percent less than the usual utensil. The recently opened branch is the latest in a string of projects in JRS Architect's growing portfolio of bank branch designs for North Fork and other financial institutions, among them JP Morgan Chase, New York Community Bancorp's Roslyn Savings Bank and Bethpage Federal Credit Union. Health and safety boards increasingly recommend the use of hydraulic fork positions, concluding that they prevent accidents by stabilising loads and enhancing the safety of the operator and co-workers. Henry's Fork is famous for its diversity of insect hatches, including salmon flies, Pale Morning Duns, caddis of all sizes, Brown Drakes and many other bugs. The whitewater trip down the Middle Fork is suited for family trips or business outings. North Fork and Commercial Bank compete directly in the Metropolitan New York/New Jersey banking market ("New York banking market"). The lodge is designed for novice to expert anglers, with a fly shop and expert guide services on the South Fork, the Henry's Fork, and other streams. From there, the water flows into the North Fork of the Shenandoah River, and then into the Chesapeake Bay.